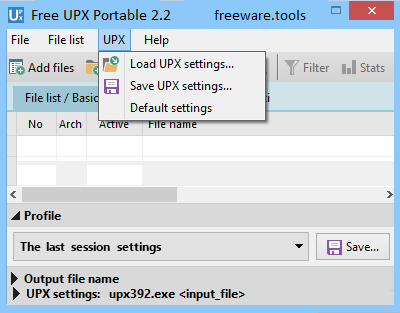 Free UPX Portable is an advanced graphical interface for the UPX (Ultimate Packer for executables). Free UPX Portable allows you to compress (and decompress) files produced according to Microsoft Portable Executable and COFF Specification (EXE, DLL, OCX, BPL, CPL and other). Free UPX Portable displays detailed information about compressed files original file size, compression ratio, UPX version, compression level and other. Simply stated, It allows you to compress (and decompress) files produced according to Microsoft Portable Executable and COFF Specification. It offers easy access to all documented and undocumented UPX parameters. Free UPX Portable represents the GUI for UPX, a tool which helps individuals pack and decompress executables. This is also the portable counterpart of Free UPX, which means you are not required to install it on your computer. You can drop the program files to a portable storage unit, such as a USB flash drive and run it on any computer you have access to, by simply clicking the executable. Furthermore, another important aspect to keep in mind is the fact that the Windows registry is not going to be affected in any way by Free UPX Portable, and there will be no leftover files upon its removal from the hard drive. This software utility supports processing EXE, DLL, OCX, BPL, CPL, SYS, ACM files, and so on. All uploaded items are shown in the main window in a list, along with details such as name, path, original and packed size, compression ratio, type, filter and method. The app integrates the “drag and drop” function, which aids users to manage files in a more efficient manner. There are multiple types of compression (normal, brute and ultra brute), and it is also possible to create a backup file and select the output folder. All these configurations can be saved to a profile (INI format), so that you can use them at a later date. A color-coded system is in place, so that people can easily identify non-executables, packed and not packed files. There are some advanced settings power users can work with, such as compression runtime parameters and debug options. To conclude, Free UPX Portable is a useful piece of software when it comes to packing and decompressing executable items. CPU and memory usage is minimal, response time is good and the feature-rich environment is suitable for both novice and experienced users.